Researchers at the University of Michigan have developed a novel chip containing fluid channels that sends blood samples through a hydrodynamic maze to separate circulating tumor cells into an analytic stream. The chip is currently being tested in a breast cancer clinical trial. Conventional cell targeting by isolating proteins known to be on the cell's surface doesn't work well. According to Dr. Nagrath, size-based sorting gets around this problem, but until the creation of what the team labels its “Labyrinth,” this technique was too imprecise to use on its own. Conventional chips, with spiral-shaped channels, left each cancer cell contaminated with thousands of other cells, especially white blood cells. 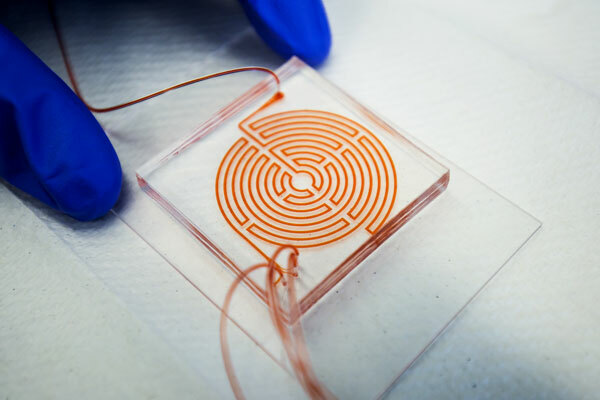 The Labyrinth chip works on a spiral, sorting the blood's contents according to the sizes of the cells, with smaller white and red blood cells accumulating in different parts of the fluid channel. The larger cancer cells are pushed a bit harder than the smaller white blood cells. At the outside of the curve, smaller particles feel more drawn to the wall of the channel. Source: Joseph Xu, Michigan Engineering Communications & Marketing. Eric Lin, a doctoral student in chemical engineering and first author on the paper (“High-Throughput Microfluidic Labyrinth for the Label-Free Isolation of Circulating Tumor Cells”) in Cell Systems, was able to fit 60 centimeters of channel on a chip that would only contain 10 centimeters in a spiral layout. “We present ‘Labyrinth,’ a label-free microfluidic device to isolate circulating tumor cells (CTCs) using the combination of long loops and sharp corners to focus both CTCs and white blood cells (WBCs) at a high throughput of 2.5 mL/min,” write the investigators. Without the need to wait for cancer cells to bind with traps or markers, the blood flow through the chip was fast, said Dr. Nagrath. The team could reduce the number of white blood cells contaminating the cancer cell sample by 10 times by running the captured portion of the blood through a second Labyrinth chip, a process that took only five extra minutes. A thousand white blood cells mixed in with about 9 to 50 tumor cells were explored in the group’s single-cell analysis lab. The researchers team analyzed individual cells to see which genes were active—and which mutations were present—in the cancer cells. Through genetic profiling, the team could pick out cells that were on their way to and from stem-like states, capturing the spectrum of cancer stem cells, said Dr. Nagrath. They tested the chip with blood samples from pancreatic and late-stage breast cancer patients. In Dr. Wicha's clinical trial, run by Monika Burness, M.D., a medical oncologist at the University of Michigan, the Labyrinth chip is isolating cancer cells from the blood of patients with an aggressive form of breast cancer. The trial is investigating whether interleukin-6 (IL-6), which helps heal wounds by temporarily activating adult stem cells, can make progress against cases of breast cancer that don't respond to standard treatments. The suspicion is that the IL-6 is enabling cancer stem cells, so they expect to see the population of stem-like cells in the blood fall during treatment.